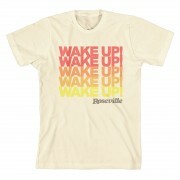 The Wake Up T-Shirt =features “Wake Up!” printed multiple times in different colours with “Roseville” at the bottom. The design is inspired by the Rose-Colored Boy Music Video. 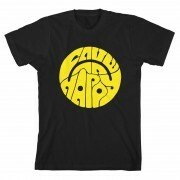 The design is printed on a cream unisex t-shirt. 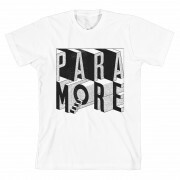 The ‘Glitter Ringer’ T-Shirt is inspired by the Rose-Colored Boy Music Video. The design features the image from the opening segment of the Wake Up Roseville show featured in the music video. 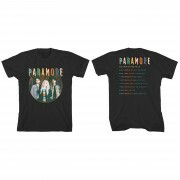 The ‘Control Room’ T-Shirt is inspired by the Rose-Colored Boy Music Video. The design features Hayley standing in front of tv screens viewing various images of herself. 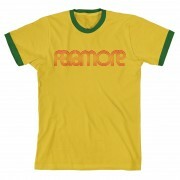 The band name and song name are printed within the design on a vintage black t-shirt. The Wake Up! Roseville Ceramic Mug is inspired by the Rose-Colored Boy Music Video.